Tomorrow be the big day, belike! Aye, Friday: the day we’ve been waiting for all year, International Talk Like A Pirate Day! Polish your hooks and sand your peg legs! If you are anywhere near Latrobe, Pennsylvania, set a course for The Art Center (819 Ligonier Street) where I’ll talk about illustrating pirates Friday evening from 6:30 – 8:30. If you miss it, I’ll be at The Art Center again Saturday morning 10:00 – noon. 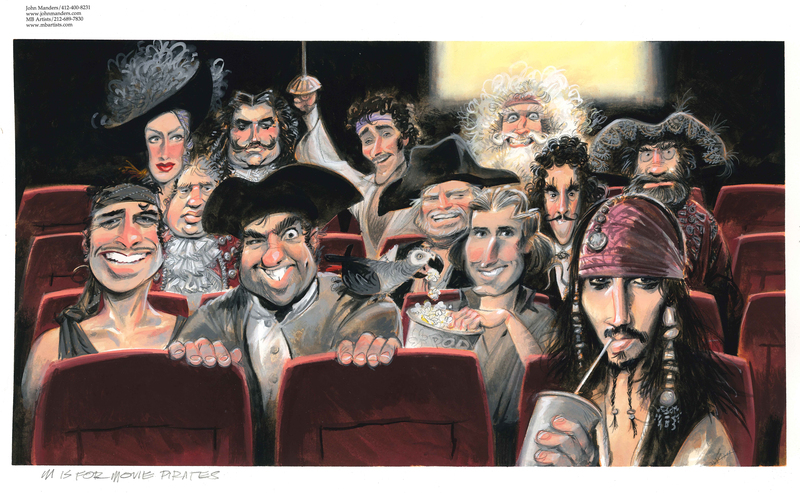 To celebrate the big day, here is an illustration from P is for Pirate—a theater full of movie pirates. They range from freebooters of Hollywood’s Silent Era to today’s swashbuckling sea dogs. How many can you name? I’ll post the answers tomorrow, by the powers! http://www.johnmanders.com/wp-content/uploads/2015/01/JohnManderslogo300w1-300x58.jpg 0 0 johnmanders http://www.johnmanders.com/wp-content/uploads/2015/01/JohnManderslogo300w1-300x58.jpg johnmanders2014-09-18 10:00:162014-09-18 10:00:16Tomorrow be the big day, belike! Alphabet Trail & Tales 2014 Hoist your flagons!